The quaint clubhouse, that overlooks the vast property, boasts a typical French restaurant which serves up some delicious food. The club itself originally began in 1909, when a nine hole course was designed. In the 1920s renowned English architect Tom Simpson was commissioned to re-design the original course and build a new eighteen hole course. However, during the Second World War Chantilly was heavily damaged, and as a result nine of the holes had to be abandoned. In the 1980s Donald Steel was given the task of constructing thirteen new holes and integrating them with the nine holes from the original Longeres Course. Chantilly only allows two balls before eleven in the morning – so the pace of play is fantastic! 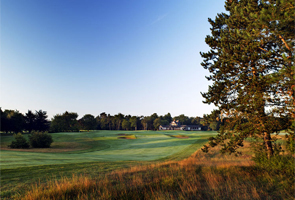 Today the Club is able to boast two sublime golf courses: The Vineuil Course (which is the one with the most original Simpson holes) and Longères – both of which measure just shy of 7,000 yards from the back tees. These 36 holes of golf help to attract golfers from across the world, which just goes to show the popularity of these two French masterpieces. It has played host to a number of French Opens including the 1913 French Open, which was the first time the event was held at Chantilly – George Duncan emerged as champion. And Duncan’s score of 304 is the highest in the history of the competition – a true testament that the challenge that the course presents. Golf de Chantilly was founded by a local prince in 1909. A lot of courses tend to ease you into the round which means that it can take a while for you to discover the courses’ defining characteristics. Not on the Vineuil Course. It declares right from the start that you will be in or a superb round of golf. The opening hole is a par-5 shows the strategic use of sand traps that are consistent right the way through the course. There are three bunkers on the right side of the fairway which mean that the only out of harm’s way shot is one which is straight down the middle, as there are also a group of trees which protect the left hand side of the hole. In total it has been the venue for the French Open Championship ten times. Nick Faldo has won two times as Chantilly. Other notable winners include Roberto de Vincenzo (“What a stupid I am!”), Peter Oosterhuis and Arnauld Massy. Other great holes on Vineuil include the 5th, a hole which ‘The World Atlas of Golf’ describes looking down the fairway from the fifth tee as the golfing equal to looking down a gun barrel. It’s a difficult hole (stroke index 1) which plays between a tight channel of trees – so taking a par will be some achievement. The 17th is also a standout hole. It is fairly reminiscent of the par-3 14th hole at Pine Valley, minus the water at the front. And although the rest of the course is a relatively flat, this hole is at least sixty feet below you from the tee in a captivated setting. It really does show the true architectural genius of Simpson. The hole really is a big contrast to the other seventeen and is both as surprising as it is inspiring. Print article This entry was posted by Jerome on April 19, 2013 at 9:51 am, and is filed under General. Follow any responses to this post through RSS 2.0. You can leave a response or trackback from your own site.